Fortune Delight® is concentrated and comes in powder form. The antioxidants in Fortune Delight have been shown effective in absorbing damaging free radicals. Customer Testimonials indicate that it also reduces cravings. Still drinking gut-busting sodas and other subpar drinks? It’s a tough habit to break but many have done just that by replacing bad-for-you beverages with the healthy refreshment of Fortune Delight®! Fortune Delight is a delicious and refreshing blend of concentrated herbs and extracts made without chemical additives, artificial flavors or preservatives. Enjoy as a dietary supplement beverage, the exclusive formulation of each product is high antioxidants that protect against free-radicals. Every day we ingest foods or drinks which may contain unnatural or undesirable elements. While many of the undesirable elements we take into our body quickly eliminated, others may be stored or even trapped, especially in fat cells. Catechin’s are naturally occurring polyphenol chemicals found in Camellia sinensis, the primary ingredient in Fortune Delight. Acting as powerful antioxidants, these polyphenols have been shown to be faster acting then Vitamins E, C and beta carotene in absorbing damaging free radicals. 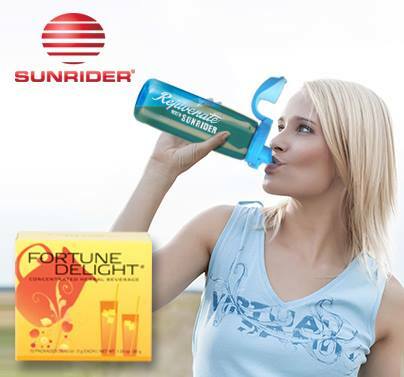 Exclusively formulated and powerfully concentrated at Sunrider’s own vast research and state-of-the-art manufacturing complex, all three flavors of Fortune Delight contain a tasty blend of natural Camellia Extract, Lemon Extract, Chrysanthemum Flower Extract, Jasmin Extract, Lalang Grass Root Extract and less then one percent of natural flavorings. Combined with a healthy meal and exercise program, the unique herbal extracts in Fortune Delight assist in the body’s natural elimination processes. Backed by the power of concentrated antioxidants, Fortune Delight® is a delicious blend of green tea and other herbal ingredients that you can feel good about drinking throughout your day. Simply mix one three-gram packet of Fortune Delight in 8 or 16oz of hot or cold water. Drink sweetened with your favorite natural sweetened with you r favorite natural sweetener or as is. 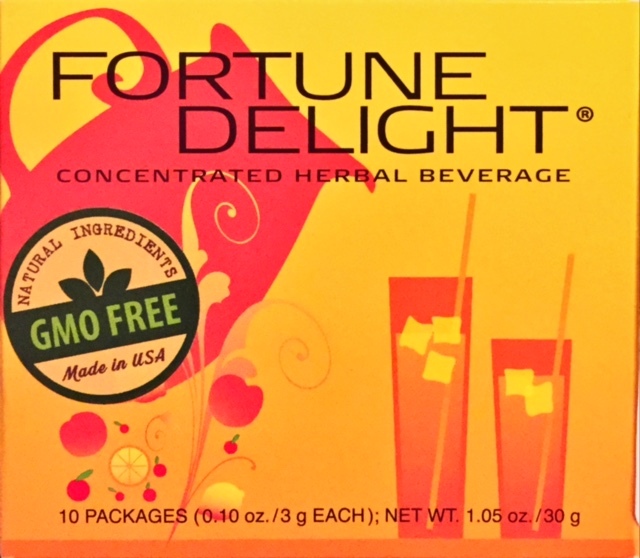 Fortune Delight is an excellent replacement for tea, coffee, sodas and other beverages. For optimum benefits, drink at least one quart of Fortune Delight per day, especially at meal time. One pack can make up to 22-oz of Tea. But, you can get more for less with the Economy Pack (save $15)! More information about Fortune Delight. Be the first to review “Fortune Delight” Click here to cancel reply.